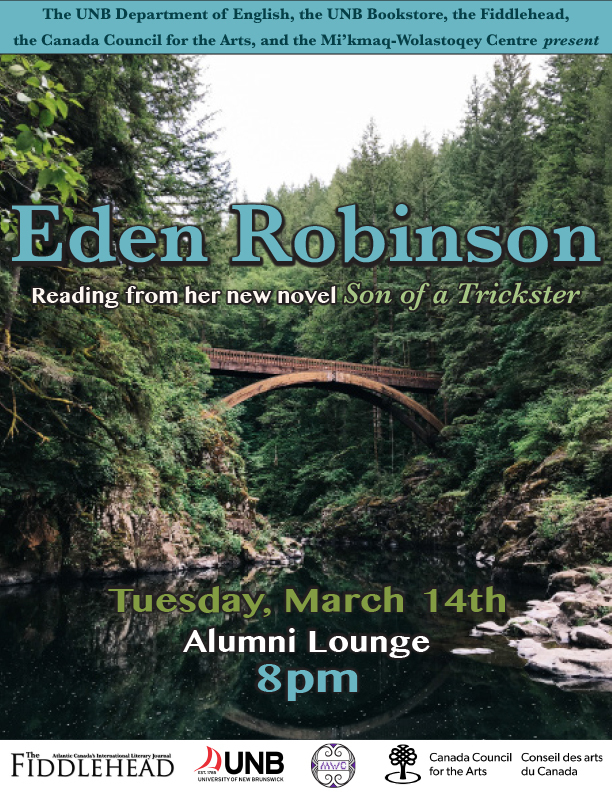 Eden Robinson, a past Writer-in-Residence at the University of New Brunswick, will be reading from her newest work of fiction Son of a Trickster on Tuesday, March 14th at 8pm in the lounge at the Alumni Memorial Building on the UNB campus. The event is free to the public and all are welcome to attend. Son of a Trickster (2017) focuses on a drug-dealing high school burnout named Jared. Jared doesn’t understand why his maternal grandmother dislikes him and calls him the son of a trickster — though he can talk to ravens, even when he’s not stoned. 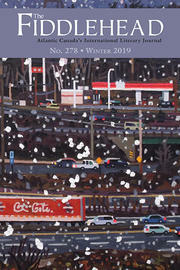 As a Native Canadian writer, Robinson’s works describe Native traditions and modern realities for indigenous peoples with beautiful, no-holds-barred language, and often biting black humour. She is the author of the collection of short stories Traplines (1996), the novels Monkey Beach (2000) and Bloodsports (2006), and the memoir The Sasquatch at Home (2011). Robinson most recently won the 2016 Writers’ Trust Engel/Findley Award. Robinson has used her celebrity to draw attention in Time magazine to the Canadian government’s chipping away at Native health care, and to the lack of subsidized housing for urban Natives. She has been a Writer-in-Residence at the Whitehorse Public Library, and will soon be working with the Writers in Electronic Residence program. This program will link schools across Canada with professional writers. This event is presented by the UNB Department of English, the UNB Bookstore, the Canada Council for the Arts, the Mi’kmaq-Wolastoqey Centre, and The Fiddlehead.